The table below shows a list of all permissions available (and a description), starting with version 5.1. 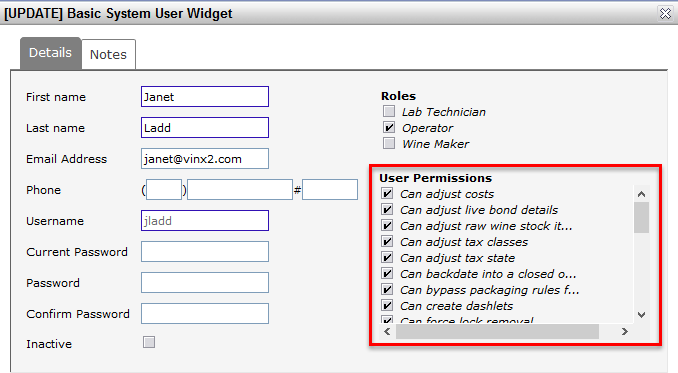 Please note the very high-level control granted to the Local vintrace Admin. This person should be familiar with the winery’s data and business practices, can make decisions about any additional costs associated with changes in the winery’s license/subscription and the ability to recognize the appropriateness of adjusting other users’ permissions. It is a good idea to have one or more Local Admin to act as back-up for the primary. Careful consideration should be paid to adding or removing permissions as these actions may allow someone to make system changes upon which they are not trained or to prevent, in the case of removing permissions, a user from performing their job function. Removing all permissions will allow a “read only” account.